The next day, being the fifth of May, the weroance of Rapahanna sent a messenger to have us come to him. We entertained the said messenger and gave him trifles, which pleased him. We manned our shallop with muskets and targeteers sufficiently; this said messenger guided us where our determination was to go. When we landed, the weroance of Rapahanna came down to the waterside with all his train, as goodly men as any I have seen of savages or Christians. The weroance, coming before them playing on a flute made of a reed, with a crown of deer’s hair colored red in fashion of a rose fastened about his knot of hair, and a great plate of copper on the other side of his head, with two long feathers in fashion of a pair of horns placed in the midst of his crown, his body was painted all with crimson, with a chain of beads about his neck, his face painted blue, besprinkled with silver ore as we thought, his ears all behung with bracelets of pearl, and in either ear, a bird’s claw through it beset with fine copper or gold; he entertained us in so modest a proud fashion as though he had been a prince of civil government, holding his countenance without laughter or any such ill behavior. He caused his mat to be spread on the ground, where he sat down with great majesty, taking a pipe of tobacco, the rest of his company standing about him. After he had rested awhile, he rose and made signs to us to come to his town; he went foremost, and all the rest of his people and ourselves followed him up a steep hill where his palace was settled. We passed through the woods in fine paths, having most pleasant springs which issued from the mountains. We also went through the goodliest corn fields that ever was seen in any country. When we came to Rapahanno’s town, he entertained us in good humanity. During the early years of the Jamestown settlement, Pepsicuminah maintained good relations with the newcomers while other native groups proved less hospitable. As John Smith himself remarked, the weroance of the Quiyoughcohannocks was an “honest, proper, good, promise-keeping king,” who “did always at our greatest need supply us with victuals of all sorts, which he did notwithstanding the continual wars which we had in the rest of his country, and upon his deathbed charged his people that they should forever keep good quiet with the English”. In the wake of the great Native American Uprising of 1622 (see ahead), the English launched punitive expeditions against the Quiyoughcohannocks and those other groups that had participated in the attacks. Though they burned their villages and seized their crops, the English were not immediately successful in displacing the Indians from their traditional Southside territory. But ultimately the flood of English settlers into the James River valley proved overwhelming to the native peoples, whose numbers were dwindling in the face of sporadic fighting and European disease, and by the 1630s, the Quiyoughcohannocks were gone. 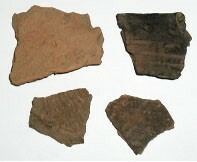 Pottery Fragments found at Mount Pleasant. Although the main Quiyoughcohannock village was located nearly 10 miles away, much Late Woodland pottery has been found in the fields around Mount Pleasant. The main concentration of pottery, however, occurs in the yard on the north side of the main house where archaeological investigation of the landscape also has uncovered posthole patterns of sections of Native American long houses. Preliminary analysis of the Native American pottery from Mount Pleasant indicates that Quiyoughcohannock ceramics have a distinctive combination of clay fabric and decoration that is strikingly similar to Native American pottery that has been recovered from the recent excavations at James Fort. This suggests an exciting avenue of potential research on the level of unrecorded interactions, such as trading for food, between the Quiyoughcohannocks and the English during the early years of Jamestown. Fragment of a Bartmann mask found in the East field at Paces Paines. In 1618 the Virginia Company of London received its third and final charter from King James I. Soon after, Company officials issued instructions to Governor George Yeardley, which brought about certain sweeping changes that ultimately assured the success of the Virginia colony. Foremost was the introduction of a system that made private land ownership legally possible. The new land policy (known as the headright system) provided an incentive to prospective immigrants to leave overcrowded England and seek their fortunes in Virginia. This in turn helped alleviate the colony’s labor shortage, for men and women who could not afford to pay for their own transportation to the colony immigrate as indentured servants. Moreover, once they had completed their term of indenture, they could become landowners themselves. The prospect of acquiring massive tracts of land also encouraged groups of wealthy investors to underwrite part of the expense of colonization. In combination, these factors fueled the spread of settlement and attracted new immigrants and investors to the colony.